Empanadas can be many things — meals on the go, snacks, fancy appetizers, or even desserts — depending on what is inside of them and their size. These empanadas are filled with pizza ingredients — mozzarella cheese, tomato sauce, and pepperoni in this case. You can fill them with any pizza toppings that you like — cooked & crumbled sausage (chorizo, perhaps), onions, black olives, anchovies, etc. 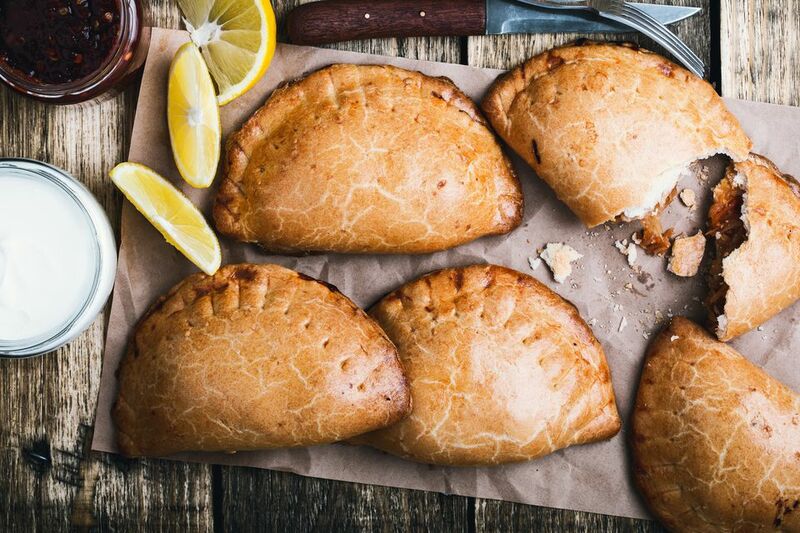 These empanadas are similar to calzones (stuffed pizza), except that empanada dough is much more tender, flaky, and less chewy than the pizza crust dough that is typically used to make calzones. These empanadas are excellent on the small side and can serve as an appetizer with extra marinara sauce for dipping. Prepare empanada dough according to the recipe. Cover with plastic wrap and let rest for 10 minutes. Grate the mozzarella and cheddar cheeses and place them in a medium bowl. Add half of the Parmesan cheese and 1/2 cup of the marinara sauce and mix well. Preheat the oven to 400 degrees. Divide the empanada dough into about 20 small pieces (approximately 50 g each) and gently roll each piece into a ball. On a lightly floured surface, take one ball of dough and roll it out into about a 4-5 inch diameter circle. Place one tablespoon of the cheese filling and one pepperoni (or another filling of choice) on the middle of the dough circle. Gently fold the circle in half to form a half-moon shape, sealing the edges firmly together with your fingers. Fold the edge over itself decoratively (see how to fill and shape empanadas). Place the empanada on a cookie sheet. Repeat with remaining balls of dough. Mix egg yolk with 1 tablespoons water. Lightly brush egg mixture over tops and sides of the empanadas. Sprinkle empanadas with remaining grated Parmesan cheese. Place empanadas in the oven and bake until puffed, shiny, and golden brown - about 20-25 minutes. Serve warm with marinara sauce for dipping. Empanadas can be stored in the refrigerator or freezer, and reheated in the oven, wrapped in foil. Or reheat them in the microwave (crust will be less flaky, but still good).